One of the most quoted lines from “The Chronicles of Narnia” is also one of the most ignored. We like to say that we know that God is not “safe,” but all too often we end up living as though our safety, or, even better, our comfort marks the boundaries of our relationship to God. Whether it’s a Postmodern reaction to the cold view of reality of its Modernist antecedent, or a sign of weariness in an increasingly fractious age, for many Christians, we cannot conceive of God’s will for our lives involving anything unpleasant or uncomfortable. I was reminded of this recently by an image floating around social media. It was nothing but a few sentences describing the way God acts in our lives, as opposed to Satan’s influence. “God’s voice” stills, leads, reassures, enlightens, encourages, comforts, calms, and convicts you, while the Enemy rushes, pushes, frightens, confuses, discourages, worries, obsesses, and condemns you. On the surface, this isn’t half-bad. But that’s the problem. It’s a half-truth, a partial truth that, while exposing some realities, also brings in some falsehoods that reinforce our cultural image of a tame God. As a line from my favorite movie puts it, the telling of a half-truth leaves us unable to truly grasp the whole. As much as we might like to think otherwise, the practice of Christianity, far being a path unstained by pain and discomfort, is quite often defined by times when God rushes, pushes, frightens, and confuses us. Now, for a lot of us, particularly those who pride ourselves as being theologically astute, we breathe a self-contented sigh of relief when we hear others espouse such things. We don’t go in for all that nonsense. We know the truth, and we accept the reality that God’s presence isn’t always going to be “nice.” We say this, and we believe it. But, how often do our lived-out beliefs fail to reach to our stated principles? When the job we longed for goes to the other guy, when the husband we dreamed of marries the other girl, when the sickness we’d worked so hard to avoid lays us low? What then? At these times, when our expectations collapse before us, we ask if God even cares. Whatever our formal theological tenets might be, we are quick to conflate God’s faithfulness to us with a painless life, a placid life, a life of blessing and provision. We are quick to assume that the presence of pain or discomfort means that something is wrong, that God’s will has been thwarted, or that His love and protection have been withdrawn. We refuse to accept that the presence of pain, far from being a sign of God’s absence, may be a sign of His sovereign care. A painless Christian life is a nice sentiment, but sentiment it is, a feeling that says a very great deal about the nature of our desires, but precious little about the world outside our longings. It is a sentiment which, however comforting in the short-term, is out of line with our common sense life experience as well as with the testimony of God’s revelation in the Bible. This was a truth that C. S. Lewis understood well. We know all about the bit in “The Lion, the Witch, and the Wardrobe,” where we hear of Aslan’s dubious safety. But this is not the only time Lewis forced us to face God’s uncomfortable sovereignty or the sharpness of His sanctifying work in our lives. Think of “The Voyage of the Dawn Treader.” There, we find Eustace Scrubb, the insufferable boy who almost deserved his name. As you know if you’ve read the wonderful book (or seen the regrettable 2010 movie), Eustace is cousin to the Pevensie kids, and he is a selfish brat. As a consequence of his willfulness, he finds himself transformed into a hideous dragon, the outward manifestation of his inner self. While there are some advantages, such as flying and breathing fire, Eustace longs to be restored to his true nature. This restoration does occur, but it does not happen without pain, great pain. At first Eustace attempts to rid himself of his dragon skin by his own strength, and, at first, he seems to succeed. The surface layers of his corruption slide off with ease, but, lying underneath is another layer needing to be shed. His skin (sin?) cannot be removed by his own power. It is here that Aslan steps in. As Eustace described it, “The very first tear he made was so deep that I thought it had gone right into my heart. And when he began pulling the skin off, it hurt worse than anything I’ve ever felt.” His beastliness was so ingrained to who he now was that he could not be made whole again without an existential transformation. The subsequent book in the series has a similar encounter with Aslan, but this time the discomfort is not physical pain but emotional terror. At the beginning of “The Silver Chair,” Jill Pole has accompanied the now-converted Eustace back into Narnia. After becoming separated from him, she finds herself dying of thirst in a strange land. Making matters worse is the fact that the only source of water is blocked by a gigantic lion. Now, we know that the lion is Aslan and that he is good, but Pole lacks this certainty and the great beast’s words to her were not exactly soothing. “Do you eat girls?” she said. “I have swallowed up girls and boys, women and men, kings and emperors, cities and realms,” said the Lion. It didn’t say this as if it were boasting, nor as if it were sorry, nor as if it were angry. It just said it. Jill was given no comfort that all would be all right. She was not reassured that he would not frighten, worry, discourage, or confuse her. She was not even told that he would not eat her! She had the choice of death through dehydration or trusting that an unknown and very real threat would do her no harm. Moving ahead, even preserving life itself, meant that Pole had to yield up any certainty or confidence that taking the next step would involve her safety. Faith for her at this moment meant stepping forward knowing only the danger and not the hope of what came next. Finally, in “The Horse and His Boy” we read of both fear and physical pain inflicted by Aslan upon the heroes of the tale. These unpleasant experiences are not merely incidental circumstances but the necessary conditions upon which the entire plot turns. The first of these is early in the story when Shasta, one of the two main human characters, is fleeing from his erstwhile adoptive father. As he races through the night on the Narnian horse, Bree, he sees a lion chasing them through the darkness. From this danger he naturally flees, only to find that another rider is fleeing, seemingly, another lion. This newcomer, Aravis, is also escaping her home. Their shared fear and confusion leads them to ride together, first for a moment, then for the entire journey, a journey neither of them could’ve made without the other. Later, as they’ve nearly escaped from the hostile land, they’re riding as fast as they can to head off a threat to Narnia. Even as Bree races ahead, he claims that he can go no faster, but he soon finds that he must go faster as a “new” lion is close on his heels. Bree knew it too. His eyes gleamed red and his ears lay back on his skull. And Bree now discovered that he had not really been going as fast – not quite as fast – as he could. Shasta felt the change as once. Now they were going all out. Soon, Aravis feels the sharp reality of the lion’s claws, and she might’ve died had the beast not retreated unexpectedly. Later, Shasta is told the full story. 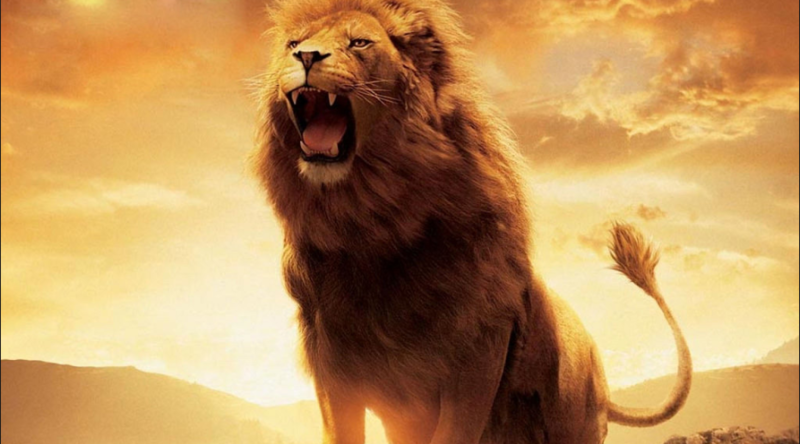 All the lions that had chased and harassed them on their way were the one Lion, Aslan. Had they not faced these fears and endured these pains, the end goal of the narrative would have never been met and their quest would’ve failed. The pain wasn’t an afterthought on Aslan’s part but a key element in his plan. Imagery used by favorite authors is one thing; the testimony of God’s own Word is quite another. When we look to the Bible, we see this pattern again and again. We see it as Jacob wrestles the Angel of the Lord. It is not an accident or enemy that brings the Patriarch his lifelong pain. It is from the hand of God Himself. We see it in the life of his favorite son, Joseph, who endures both slavery and prison, all so he will be in position to save God’s people. We see it in the life of Jeremiah who preaches to his people for years on end, never finding success, but remaining faithful in the face of intense opposition. They endured these things not apart from the faithfulness of God but as part of their obedience to His plan. Does this mean that we should go out looking for pain? Of course not! The pain is no more the point of God’s plans than it is the purpose of the suffering we endure in physical exercise. If we never push ourselves to the point that it hurts, we’ll never know if we’re improving our health. If, on the other hand, we’re so foolish to seek the pain as our goal, we’ll be just as likely to do ourselves harm as we are to aid our well-being. The pain is not the point, nor is it itself good. But whether we’re talking about mundane lethargy or spiritual intransigence, breaking with the bad habits of the past requires pushing beyond our comfort levels, through the pain, and onward on the path to full restoration. This pain may mean giving up on a goal we’ve had for years. It may mean turning aside from an addiction or sexual impulse that has defined us as long as we can remember. It could mean yielding the safety of suburbia for the turmoil of city life, or it could mean accepting that our faithfulness to God will show in the ordinary things of life, unpraised by the the watching world, and far from the “radical” obedience we’ve long aspired to. Whatever the case, whether it means sickness or sacrifice, ending a dream or enduring hostility, we must remember that God’s faithfulness to us is not determined by how well our lives are going, and may even be seen most of all in the hard things of life. To deny that God would use discomfort for our good is to deny to us the hope that He may be present in our pain. It would leave us alone in our pain. The faithfulness of God to His people is so deep and abiding that it surpasses any desire on our part for a life of ease and comfort. God is, indeed, the God of all comfort, but, just as His quest to restore the glory of His creation did not shrink back from inflicting pain on His dear Son, His love for His people will not refrain from causing us the discomfort needed to restore His Image Bearers to their intended dignity.